Welcome to our first guest author interview! Today we’re interviewing one of the authors we had the pleasure to meet at the Northwest Book Festival in Portland last month, Mary Jo Nyssen. 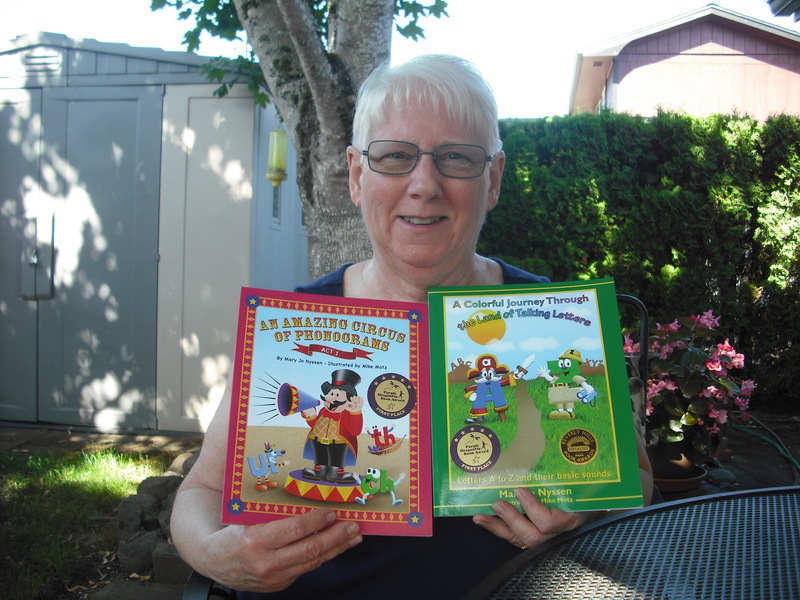 Mary Jo is the author of several children’s books for beginning readers. Her books are eye-catching, educational and fun to read. Tell us a bit about yourself and your books, A Colorful Journey through the Land of Talking Letters and An Amazing Circus of Phonograms: Act 1 (Volume 1). I was born in South Dakota, but grew up in Salem, Oregon, where my husband and I still live today. As a child, I struggled with reading. After overcoming the challenge, however, I grew to love books and even started writing my own poetry. Though I chose a career in nursing, I never strayed far from my love of words. As a mother I decided to take a community college class on a multisensory phonics method. After using it to successfully teach my daughters, I soon gained further expertise by helping other children, parents, and teachers. There are 70 phonograms a child needs to know in order to read, write and spell most of the words of the English language at an early age. After introducing the first 26 letters (phonograms) in my first book, A Colorful Journey through the Land of Talking Letters, I decided to write 2 more books to present the other 44 multi-letter phonograms. My second book, An amazing Circus of Phonograms – Act 1, presents 22 of these multi-letter phonograms through a clever ringmaster, who introduces each phonogram and its sound(s) through hilarious acts in which the phonograms join in on. In 2009, when I was teaching my preschool-age granddaughter the alphabet, I began creating silly rhymes to make learning the sounds of the letters more fun. My granddaughter loved the stories so much that I wanted to make learning these 70 phonograms, which I learned in the multisensory method I took, fun for all children to learn. These stories became my first book, A Colorful Journey through the Land of Talking Letters, in which each letter introduces itself and its sound(s) using the humorous stories to highlight these sounds individually. How would you say your books are different from other books on the market for beginning readers? My books actually separate the phonogram sounds and highlight them so the child can see and hear the repetition of them in isolation. For instance most ABC books I’ve seen do not do this and the child does not learn that there are 3 sounds for letters such as A, O and U. When I realized that children really enjoyed my book, I felt that I needed to share the other 44 phonograms in a fun way as well with them. How did you connect and collaborate with your illustrator to get just the right look for your books? I found my illustrator, Mike Motz, online and chose one of his illustrators. The one I chose worked very closely with me online, and did a wonderful job of drawing what I wanted. Do you have plans to offer an audio version of the books? I do have my books on audio and they can be purchased as a download from my website, and I also sell them as a CD in person. I am presently working on my third book, An Amazing Circus of Phonograms – Act 2, which is a continuation of the last 22 multi-letter phonograms. And finally, what advice can you give to first time authors? My advice for first time authors is never give up. When you hit a roadblock, stop and then come back at another time. My first book was 66 pages when I submitted it to the illustrator and he told me it had to be cut in half because a children’s book is only around 30 pages. He helped me to cut it down and make it a great book that has already won 2 awards for best picture book for ages 4-8, and best illustrations for a children’s book. And my second book won 1 award for best picture book for ages 6 and older. We’d like to thank Mary Jo for participating in our first guest author interview. This entry was posted in Uncategorized and tagged author interview, beginning reader, book festival, book promotion, guest author interview, Litzophreniacs3, mary jo nyssen, Northwest Book Festival, Renna Olsen, self-marketing, self-publishing, writing collaboration. Bookmark the permalink.